APILE is used to compute the axial capacity, as a function of depth, of a driven pile in clay, sand, or mixed-soil profiles. Several methods are used by APILE for computations of pile capacity: i) American Petroleum Institute (API RP-2A), ii) U.S. Army Corps of Engineers (USACE), iii) U.S. Federal Highway Administration (FHWA), and the iv) revised Lambda method. The special APILE Offshore version includes four other CPT based methods: v) Norwegian Geotechnical Institute (NGI), vi) Imperial College Pile method (ICP and also referred as the Marine Technology Directorate or MTD method), vii) University of Western Australia (UWA) and viii) new in APILE v2014 is the Fugro method (all mentioned in the latest API RP-2A manuals). The APILE program also provides a flexibility allowing users to specify any set of values for load transfer in side resistance and end bearing as a function of depth. This feature is useful for cases when site data is available from instrumented axial load tests. A short-term, load-settlement curve can be computed for driven piles of a specific length. The APILE program uses internally generated t-z curves (load-transfer in axial side resistance as function of movement) and Q-w curves (load-transfer in end bearing as function of movement) for developing the load-settlement predictions. APILE allows the implementation of new LRFD analyses (AASHTO LRFD Specifications) so users may enter independent reduction factors (resistance factors) for skin friction and end bearing on each soil layer in the model. This new feature may also be useful to implement strength reductions during pile driving, or for overall pile-group reduction factor. * APILE download link provides demo version of the software for Regular and Offshore. 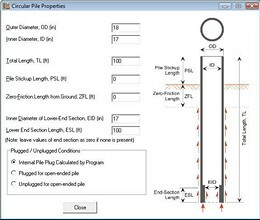 LPILE is a special-purpose program based on rational procedures for analyzing a pile under lateral loading using the p-y method. SHAFT is a computer program used to evaluate the axial capacity and the short-term, load-settlement curves of drilled shafts or bored piles in various types of soils. TZPILE implements the well-known method of soil-structure interaction, commonly called the t-z method, where t-z and Q-w curves are used respectively for load transfers in side resistance and end bearing. 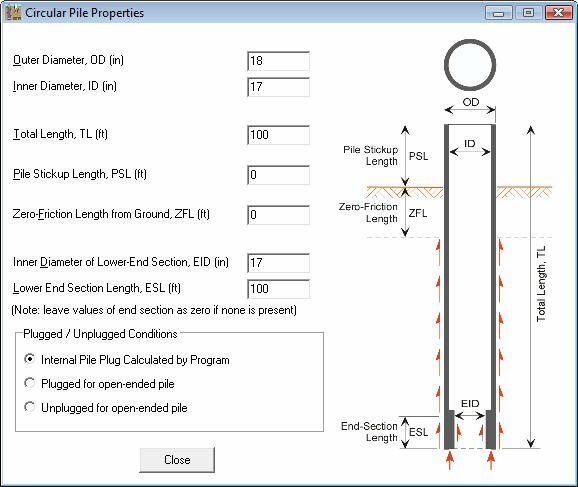 PileROC is a program that predicts the load settlement curve at the pile head for the piles socketed into rock based on three commonly-used methods. APILE has been rated 5.0 out of 5 points. A total of 1 votes cast and 0 users reviewed the software.